The Boxer was bred in Germany from the Bulldog and the now extinct Bullenbeisser ('bull-biter'). It was bred to chase, bite, and hold onto large game such as deer and boar. The Boxer's name may be derived from the German 'Boxl' for 'short trousers' or from the dog's tendency to stand on its hind legs and swing its forelegs when fighting or playing. U.S. soldiers brought the Boxer home to America where it became a popular pet (the seventh most popular U.S. breed as of 2006) after World War II. In the last century, Boxers have also been put to work as messenger dogs, guard dogs, cattle herders, and police dogs. The Boxer has a shoulder height of 53-63 cm (21-25 in) and weighs 24-32 kg (53-70 lbs). Boxers are strong, compact, and agile, with broad powerful jaws and a small nose which enables it to breathe while hanging onto an animal. Boxers have docked tails and may have cropped ears. They have a distinctive head with long lower jaws and broad muzzles. The Boxer’s head should be unwrinkled, with slight wrinkles on the forehead when concentrating. 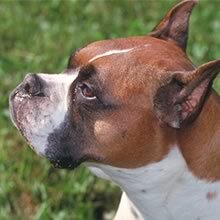 The Boxer has an arched skull, sloping shoulders, and high tail. Boxers carry themselves proudly. The Boxer has a short, smooth, shiny coat. It may be fawn (light tan, yellow, or light reddish), brindle (light/dark striped), or red. A black mask around the nose and jaws and white markings (“flashings”) on the belly, chest, and feet are possible, but white should not cover more than a third of the Boxer. The Boxer is an average shedder. The Boxer is happy, friendly, intelligent, attentive, and loyal. Boxers develop strong, close bonds with family. They have lots of energy and a serious demeanor, though they can be clownish and playful as well. They like to grab and carry around just about anything they can in their mouths. Boxers tend to get rowdy when the food bowl is empty. They make excellent guardians and companions. The Boxer is happy, friendly, intelligent, attentive, and loyal. Boxers develop strong, close bonds with family. They have lots of energy and a serious demeanor, though they can be clownish and playful as well. They like to grab and carry around just about anything they can in their mouths. Boxers tend to get rowdy when the food bowl is empty. They make excellent guardians and companions. The Boxer gets along especially well with children. They also get along well with other dogs and household pets, but may be aggressive towards unknown dogs. It is best if the Boxer undergoes early socialization due to its strong, boisterous personality. Female Boxers may fight each other on occasion. They are naturally inclined to protect you and your family from strangers. You can find American Boxer puppies priced from $150 USD to $2500 USD with one of our credible breeders. Browse through our breeder's listings and find your perfect puppy at the perfect price. The Boxer’s coat can be kept in good condition by brushing occasionally to remove dead hair. The Boxer requires frequent human companionship. Boxers do not like excessively hot or cold weather and should not be left to live outdoors. Some Boxers may snore, drool or have flatulence. White Boxers are at higher risk of deafness. Boxers have an average lifespan of 10-12 years and will remain fit and athletic into old age. They have litters of 2-10 puppies. American Boxer Puppies for Sale - Shipped Worldwide! Finding the right American Boxer puppy can be dog gone hard work. PuppyFind® provides a convenient and efficient means of selecting and purchasing the perfect American Boxer puppy (or American Boxer puppies) from the comfort of your home, 24 hours a day, 7 days a week. Take advantage of our PuppySearch or leisurely browse our directory of hundreds of dog breeds, American Boxer dog breeders, American Boxer dogs for adoption, and American Boxer puppy for sale listings with photos and detailed descriptions. Some American Boxer puppies for sale may be shipped Worldwide and include crate and veterinarian checkup. Many American Boxer dog breeders with puppies for sale also offer a health guarantee. With thousands of American Boxer puppies for sale and hundreds of American Boxer dog breeders, you're sure to find the perfect American Boxer puppy.